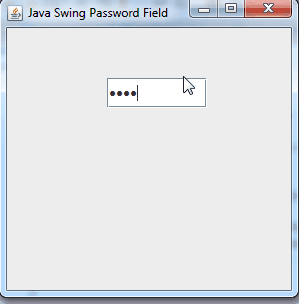 Hello friends, Today we will learn about how to create and use Java Swing Password Field .In previous tutorials we learnt about different-different classes within javax.swing package.If you did not see my previous tutorials then go through my previous posts. Link is given below …. And now we will learn about an another class JPasswordField which is defined within javax.swing package. 1.1 What is JPasswordField ?? It is a class defined within javax.swing package. It is just like a JTextField in which a user gives input. The difference between a JTextField and JPasswordField is that whatever input we give in the textfield it’s original form doesn’t display instead of it displays in the form of echo characters. We can set an echo character for the JPasswordField using setEchoChar() method which takes a character as an argument. Some of it’s constructors are given below …. JPasswordField() –> Creates a default object of JPasswordField class. 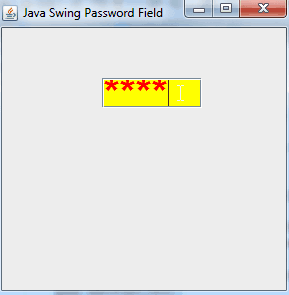 JPasswordField(int columns) –> Creats an object of JPasswordField class with specified number of columns. 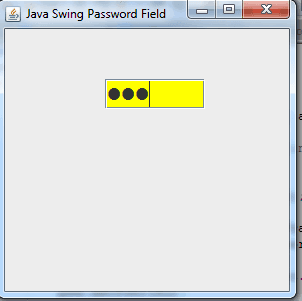 JPasswordField(String Text ) –> Creates an object of JPasswordField class with specified text. JPasswordField(String Text,int columns ) –> Creates an object of JPasswordField class with specified text and number of columns. char getEchoChar() –> It is used for returning the character that is to be used for echoing. void setEchoChar(char ch) –> It is used for setting the echo character used for password field. It takes a character as its argument .The default Echo character of a JPasswordField is “●”. We can set it to any other character using this method. char getPassword() –> It is used for getting the password contained in the password field . So this was the brief description of JPasswordField class and now we will see how to create JPasswordField…. Next we will set the location and size of JPasswordField using setBounds() method and then we will add it to the container. For setting the font style and font size of JPasswordField we will follow the exact same process while we were dealing with JLabel. 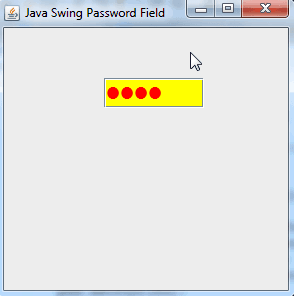 For Setting the Background color of JPasswordField we will use a method setBackground(). For Setting the Foreground color of JPasswordField we will use a method setForeground(). For this we need to call the method setEchoChar() which takes a character as an argument . we will be calling this method using the object of JPasswordField class. As we can see in the above image we have changed the Echo character to “*”. 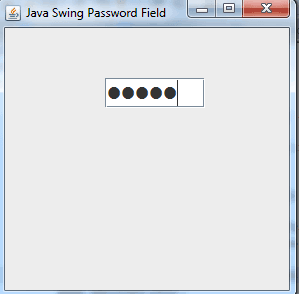 So guys this was all for this tutorial java swing password field . Please do comment and let me know if you are having any problems to understand this tutorial.Thank You. Thanx for the compliment !! !